Wrangling these wave tanks really is a full time job, but we have making progress with our next round of prototyping this week. 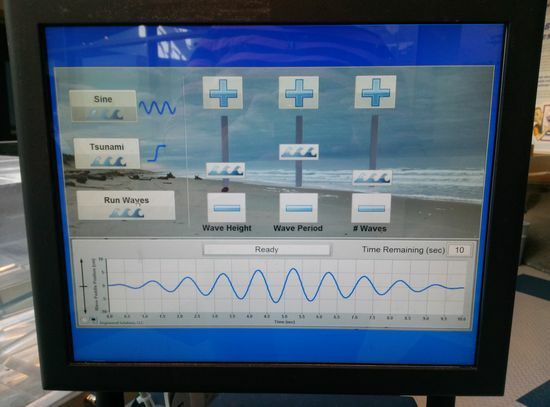 The tsunami tank has had an interface face lift with updated kiosk software, and the technical issues we were having with the wave makers locking up seem to have been subdued (fingers crossed). 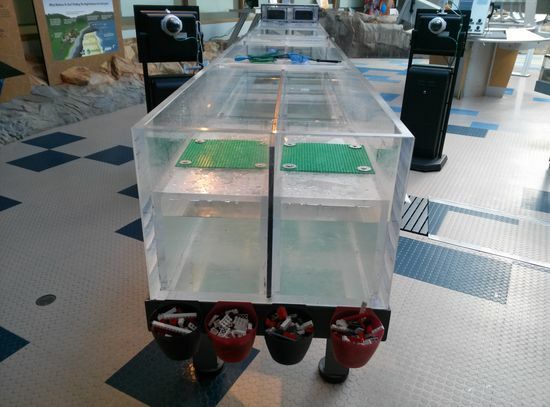 We were having issues with visitors throwing lego for building their tsunami-resilient structures all over the place, so I moved the lego storage actually on to the tank using clip-on cups. I also decided to start using plastic sign holders to prototype signage actually on the tank. This way, I can switch out sign versions easily and more frequently if I need to. These are just simple slanted sign holders I clipped in to the edge of the tank table. We also moved our prototype wave buoy closer to the wave energy tank, and Allison is in the process of making up some labels for it. Right now I am working on overarching signs to tie the three tanks together, and create a more holistic wave laboratory exhibit. Here is the plan I have so far to help us work toward this. Posted in Exhibits, Free-Choice Learning, Interpreters, Museums. I have been creating a annotated panoramic plan of the wave lab area to start to tackle each tank and its signage. I seamed together images of each tank and have been annotating it with some of the signage ideas we have been brainstorming the last few months. The idea is to build into the tanks the overarching interpretive themes, which then feed into more specific themes per tank. The themes are really key here, as they help to frame the key ideas of the tanks and therefore what the main ideas presented in the signage will be. Once I get this image completed, I’ll post some pictures. Feedback is always welcome! Posted in Exhibits, Free-Choice Learning, Museums. The semester is ending, and as I will be graduating the end of next week, it’s finally sinking in that my time in grad school is coming to a close. The final copy of my dissertation was handed in at the end of the last month, and ever since I have been considering what types of publications I would like to work on while transitioning back in the real world. Deciding on publications is really more tricky than it seems. I’m trying to find opportunities that reflect my approach as both a researcher and an educator. Of course, my choices will be job dependent (a matter I am still diligently working on) due to time and project constraints, however I have been thinking about writing articles that both highlight the theory I generated around docents in science museum settings, and are able to communicate the practical implications for the field. Myself and Michelle are considering an article together that links our two pieces of work (mine on existing docent practice, hers on training methods), and myself and Susan on interpretation in museums. Both will be equally interesting to pursue. I’d particularly like to write something that is useful to informal science education settings, in terms of docent preparation and interpretive strategies in museum, as I am an advocate for promoting the visibility of free choice learning research to those that develop programming in the field. Just like scientist engagement in education and outreach is an important part of science education, as researchers we are also part of a community that should attempt to engage the free choice learning field in educational research. Outreach works both ways. What’s interesting about this process is trying to work out which journals are also most fruitful to pursue. I was encouraged by both my committee to attempt to publish in the Journal of Interpretation (National Association for Interpretation), but I have also been thinking about Current (National Marine Educators Association), American Educational Research Journal (American Educational Research Association) and Visitor Studies (Visitor Studies Association), but there are a lot more to consider. It’s a little overwhelming, but also exciting. 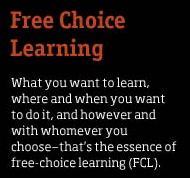 For me, this is where the rubber hits the road – the avenues where the outcomes of my work can become part of the larger free choice learning community. Posted in Free-Choice Learning, Qualitative Data, Research, Theory and Frameworks. Since defending and getting back in to our lab duties full time, Katie and I realized today there are a lot of tasks to tackle for the lab before the summer break! Basically it’s all about getting the lab’s ducks in a row and putting in place some procedures for both research and equipment that will help the lab move forward in the future and ease transitions with new students and new scholars working with the lab. Firstly, we’ve come to a space crunch with the visitor center tech storage. So the first task is to clear out unused or unwanted pieces we have been holding on to in order to minimize our space needs and make room for tech development and new equipment in the future. Secondly, we need to inventory everything we have so far. There are so many pieces of cameras, mics, etc that we have experimented with and tested that need to be accounted for and documented. This is an essential step because it will help us decide what we are still missing from our suite of tools, and put some equipment loan procedures in place to protect the quality and security of the equipment. Thirdly, there are research agendas that need developing. These will determine the next stages for getting research and data collection moving in the visitor center within the overarching lab agenda, and help drive technology development for the lab for the future. They will also help us plan next steps for ongoing IRB applications. Research tools aren’t much good if you’re not sure how you will be using them for research. Lastly, there are the next steps. We will be making data collection and technology development plans for the upcoming months to help build research “game plans” and tasks lists for the future. All in all, it’s quite an exciting time for the lab, and for me personally I love all this organizing and “cleaning house”. Knowing where you are in a project and where you are going in my opinion makes for great future products. While taking a short break during some late night studying in the library last night, Susan and I got talking about the difficulties in our field of figuring out a theoretical framework for studies. Susan has just begun a new qualitative methodologies class in the Sociology department here at OSU and was showing me some cool insight she had gained from the class around the differences between a positivist and a interpretivist framework for social science studies. She was describing where she felt she belonged, and why it seemed appropriate to take a mixed-methods approach to her upcoming research on family learning in museums. Here’s a nice little factsheet I found highlighting the differences. What we realized was, as graduate students, we had yet to have very little conversations with other researchers about their theoretical and methodological approaches, and why they had taken such paths in their academic careers. We were aware of the theoretical and methodological choices we’re presented with, but realized that we somehow had avoided those conversations in case of conflict. I position myself as an interpretivist and a qualitative researcher, and like many others have had to endure at one point or another a skeptical and frowning positivist while explaining my research, and, I’m sure the reverse case is not uncommon. It got me thinking that, similarly to us avoiding confrontation in education around climate change and evolution, the positivism vs. interpretivism conversation has become as equally controversial. But why? Isn’t this discussion simply about the choices we make as researchers? I argue that conversations around our choices as upcoming academics is as important to our research development as the time we spend writing lit reviews, and we must not avoid them simply to avoid having to defend our choices outside of our theses. Understanding the choices our peers make is part of the process of understanding our field as a whole, and allows us to think outside the bubble of our research norms for future work, which of course drives innovation. As a set of tools for learning research applicable to a variety of theoretical and metholodical approaches, the free-choice learning lab has some interesting opportunities in the future for scholars to interact with those outside their “bubble”. I’m looking forward to finding out what kind of impact that has on the research that takes place within it. I’ve been thinking a lot about grounded theory for my dissertation writing lately, and its role in the development of strategies for qualitative coding, so I thought I’d share some resources I found. Grounded theory, which emerged from the work of Glaser and Strauss, is an approach I took in my work because it allows you to discover theory from data in order to generate hypotheses, rather than test hypotheses. I have found it a useful approach in a realm of study where past literature is scarce and more theory is required, and also because it appeals to my beliefs that free-choice learning research needs more base-level ground work in some areas regarding teaching and practice. In terms of qualitative coding, grounded theory has helped framed the constant comparative method. Here, you code descriptive data (i.e. interviews, videos) by the themes that emerge from the data, either describing those themes using the language found in the data itself ( “in vivo”) or using terminology a researcher applies based on the conceptual framework of the study. In essence, you constantly compare the emerging themes to one another to make larger groups of themes that help you build a claim about the data. I’ve used this method for data analysis several times, and although it is long-winded, I find it amazingly useful for getting to know your data from the inside out. What I like about these videos the clarity of the conversation around strategies and approaches behind qualitative coding, which I think are incredibly useful for helping to better understand not only how to code, but the different qualitative approaches that are out there for researchers. In the past, I had been confused by the literature in terms of how specifically to apply grounded theory and coding in practice, but I think these videos really help put the literature together in a meaningful way. They’re also a good example of social science outreach, and helping others understand the mechanics of qualitative research.